The Federal Bureau of Investigation placed 1970s Black radical Assata Shakur — formerly known as Joanne Chesimard — on their list of Most Wanted Terrorists on May 2, 2013, the 40th anniversary of the murder of a New Jersey State trooper the government says Shakur is responsible for. Shakur is the first woman ever to be placed on the terrorist list, which was established by former President George W. Bush following the Sept. 11, 2001 terror attacks, and the 46th person overall. Osama bin Laden, leader of Al-Qaeda, was on the list until he was killed in Pakistan in 2011. The FBI also doubled the State of New Jersey’s reward for her capture to $2 million. In 2005, on the 32nd anniversary of the shooting, New Jersey announced it was offering a $1 million dollar reward for information leading to Shakur’s capture. 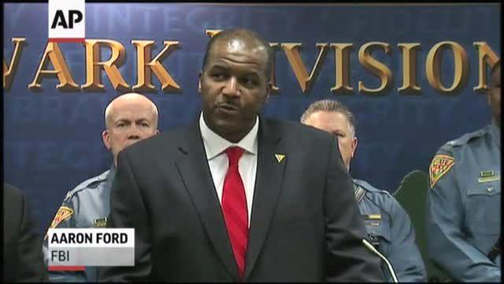 Aaron Ford, Special Agent in Charge of the FBI’s Newark office, made the May 2nd announcement in a news conference. On May 2, 1973, a shootout occurred on the New Jersey Turnpike in which New Jersey State Trooper Werner Foerster, who had stopped Shakur and two of her associates, was killed. Shakur was wounded in that shootout; her associate Zayd Malik Shakur was killed and the third man, Sundiata Acoli, escaped and was apprehended three days later. Shakur was found guilty of murder in the killing of Trooper Werner Foerster and sentenced to life plus 33 years in 1997. She escaped from prison in 1979 and surfaced in Cuba several years later where she was granted political asylum. The placement of Shakur on the terrorist list and the doubling of the reward for her capture has angered activists and caused concern for civil libertarians who claim that Shakur is the one who deserves justice. “Through her writing, Assasta Shakur has educated generations about how the FBI [through its CounterIntelligence Program – COINTELPRO] operated with impunity to neutralize the Black Panther Party. Labeling Assata a terrorist and putting a bounty on her head is a clear attempt by U.S. authorities to hide this chapter in history,” said Heidi Boghosian, executive director of the New York chapter of the National Lawyers Guild. The group released a statement on May 2 calling for the FBI to respect Shakur’s political asylum status. Attorney James Simmons of Human Rights Advocacy in Los Angeles, who also noted the legality of Shakur’s asylum status, said that it was an extension of the war that had been waged against Ms. Shakur and other activists like her back in the late 60s – early 70s. A 1988 article in the Washington Post noted that, between 1973 and 1977, Shakur was indicted ten times for a variety of offenses including bank robbery, kidnapping and murder. Three trials resulted in her acquittal; one trial resulted in a hung jury; three of the indictments against her were dismissed without trial; and she was convicted in the death of Trooper Foerster after a change of venue to a New York county where all of the jury members on the trial were white. Forensic evidence submitted at Shakur’s trial showed that she had been shot while her hands where raised in the air, and that her wounds precluded her from holding or firing a weapon. In 1998, as then-Pope John Paul II made preparations to visit to the island of Cuba – the first time a religious leader from the Vatican had ever visited the island since its 1959 revolution – the New Jersey State Police wrote the pontiff requesting that he pressure former President Fidel Castro to return Shakur to the U.S. Alongside of that request was a resolution from the U.S. House of Representatives that called on Cuba to extradite Shakur and others who had fled the United States seeking asylum from political persecution. Cong. Maxine Waters (D-CA, 43rd), initially voted in favor of the resolution but issued a retraction the next day, saying that the legislation referred to Shakur by her birth name of Joanne Chesimard and that the measure had been “quietly slipped [onto an] accelerated suspension calendar reserved for non-controversial legislation” by Republicans. In her 1998 statement Waters said that she supported the right of Cuba to grant political asylum to persons just as she supported the right of the U.S. to grant asylum to others, and that she supported Shakur’s right to seek to also seek asylum. “In a sad and shameful chapter of our history, during the 1960s and 1970s, many civil rights, Black Power and other politically active groups were secretly targeted by the FBI for prosecution based on their political beliefs. The groups and individuals targeted included Rev. Martin Luther King Jr., Cesar Chavez, officials of the American Friends Service Committee, National Council of Churches and other civil rights, religious and peace movement leaders,” Waters said in her 1998 statement. “However, the most vicious and reprehensible acts were taken against the leaders and organizations associated with the Black Power or Black Liberation Movement … This illegal, clandestine political persecution was wrong in 1973, and remains wrong today. Attempts to reach Cong. Waters for a statement on this recent development in Shakur’s case were not successful by press time. Activists nationwide have scheduled a week of teach-ins from June 2nd – 9th to discuss the case of Shakur and other victims of the FBI’s CounterIntelligence Pro­grams. Information on those activities can be found at www.assatateachin.com. A teach-in has been scheduled for the Los Angeles, with the location and time to be determined. Interestd persons can call 424-200-4968 for further information.